If you could only grow one group of edibles, herbs should be at the top of your list, due to their versatility in the kitchen. 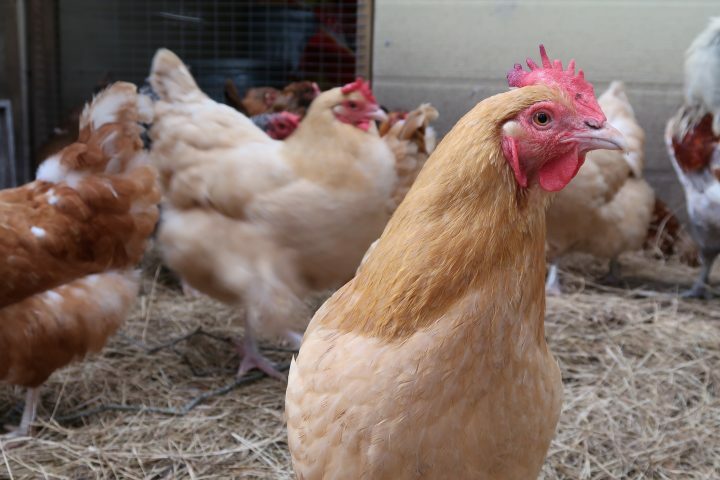 They are also easy to grow, due to their forgiving nature and generally not picky on their soil conditions. When you consider that purchasing a cut bunch of herbs is the same price or more than a small potted plant, it just makes sense to grow them yourself. 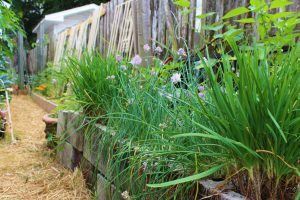 Garlic and chives planted in blocks make use of an otherwise useless space. 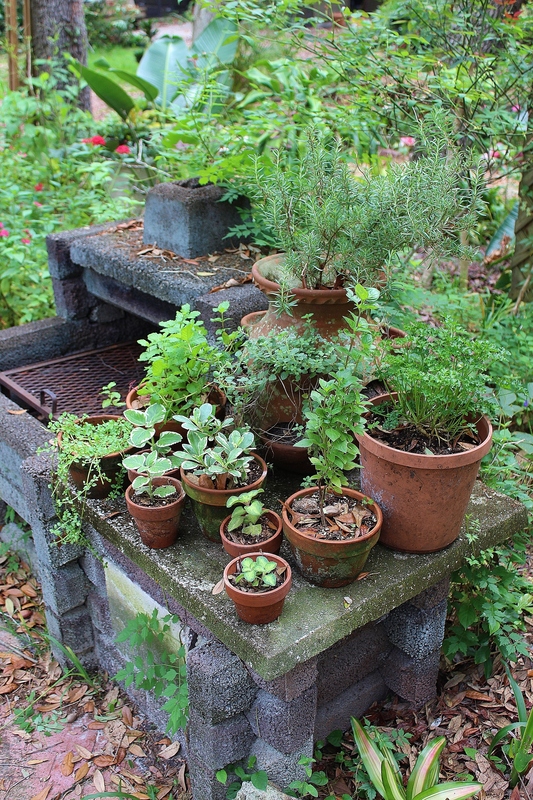 By having herbs along the walkway, ‘cut and come again’ cooks have it easy. We all have small areas that we pass by every day that we over look. We should stop thinking of an herb garden as a dedicated garden bed for herbs, and start integrating our herbs into the topography of our homes. 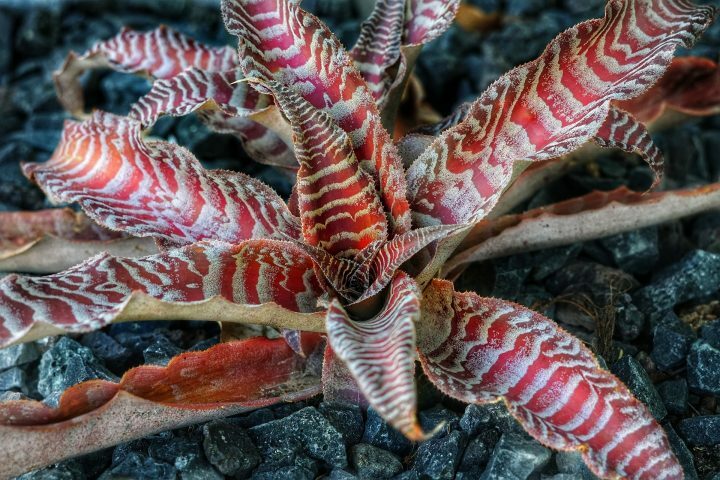 It is true that some can be used as groundcover in our gardens, but they do not have to be given that much space. Place them in pots in between your flowers or other edibles. Exhibit them near small, underutilized locations such as on front steps, windowsills, back porches, in your kitchen, adjacent to grills and food prep areas and you will be encouraged to use them often. Herbs are great for not only cooking with but also for adding textures, scents and visual appeal to your garden. Luckily for us, herbs will grow in just about anything. They are easy to grow in containers for yearlong supply or for those with limited space. Herbs don’t need to be fussed over. Aside from starting with a high quality organic soil that contains trace minerals, I do not fertilize my herbs. If you find that your plants are lighter green or have mottled leaves you can add a diluted liquid fertilizer that contains nitrogen, phosphorus, potassium and a small amount of trace elements every two weeks. Exhibiting herbs adjacent to grills and food prep areas which are all small, underutilized locations that will encourage you to use them. Investing in a loose potting soil that maintains moisture is ideal. Herbs generally have small root systems and don’t mind getting dried out in-between watering. Thyme and oregano will not be as flavorful if they get a lot of water. Oregano will even grow in poor soil. By regularly harvesting you will get bushy contained herbs. Pinch terminal growth every few days to keep plants looking full. The more you harvest the more you get. During the growing season, you could use the ‘cut and come again’ approach to use them in the kitchen every day. You must use them or you will lose them. Harvest before they set flowers. Most herbs will require plenty of sun, typically 6 or more hours. For herbs grown indoors a south or east facing window is best. 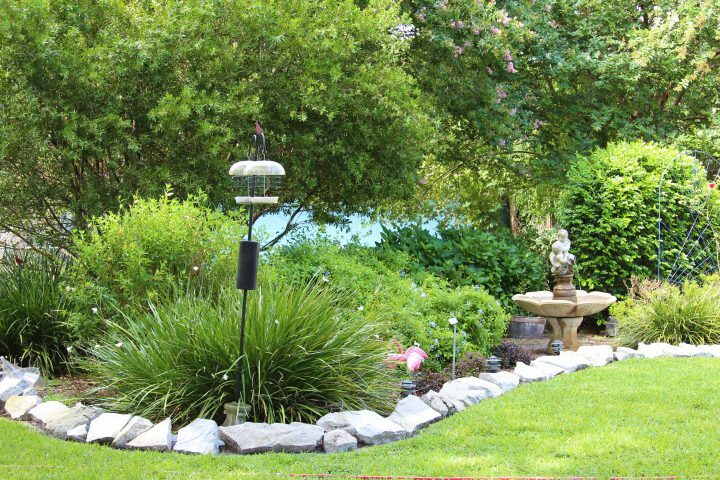 Herbs that are labeled as full sun elsewhere may do best in partial shade in the south. Not many herbs can be grown in full shade, but many can grow in lightly shaded areas. 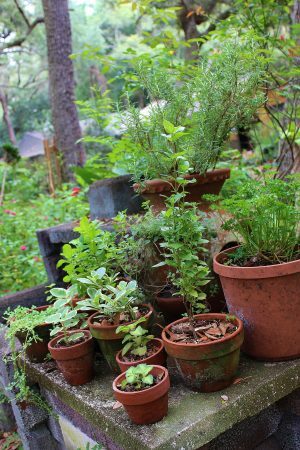 Small pots, like those seen in many magazines which show 2-3 inch terracotta pots with herbs growing in them, in reality dry out very quickly. If I cut a large part off for cooking, I try to root the stem. If even a small portion of the cuttings make it I am happy. I can’t have enough herbs. I do use small pots for newly rooted cuttings. Some herbs, you may not want to ever plant in your garden, like mint, due to its spreading properties. What’s your favorite herb combination? Originally published in the May/June issue of Florida Gardening.